(CBS News) GoDaddy, the domain registrar and Web hosting company, experienced outages Monday, perhaps taking millions of websites down as a result. "Status Alert: Hey, all. We're aware of the trouble people are having with our site. We're working on it," @GoDaddy tweeted. While GoDaddy.com's site is up and running, websites hosted by the company are still experiencing outages. "Some services are back online," a GoDaddy spokesperson told CBS News. "It's been intermittent and impacted our site and some of our customer sites. It started at about 10 a.m. PT and we are working to restore all service." 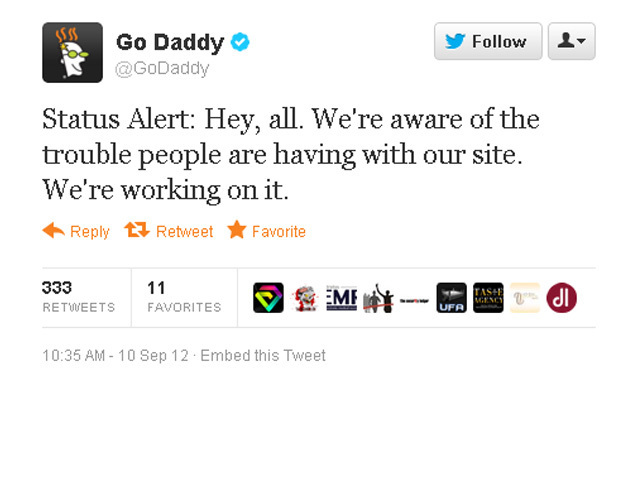 TechCrunch reported earlier that GoDaddy-hosted email addresses were down, as well. The blog suggests customers concerned with that their site has been affected can check online status at Down For Everyone Or Just Me. A quick call to the company's customer service line resulted in a voice message stating that the company is aware of issues involving several services, including web hosting and emails. The company suggest following its Twitter page for updates. Twitter accounts thought to be associated with the hacking group Anonymous claimed responsibility for the attack. "By using / supporting Godaddy, you are supporting censorship of the Internet," @AnonOpsLegion tweeted again later. GoDaddy was the target of protests after it was discovered that the company supported unpopular bills the Stop Online Piracy Act (SOPA) and Protect IP Act (PIPA). The company's latest tweet reads: "Update: Still working on it, but we're making progress. Some service has already been restored. Stick with us." GoDaddy did not specify at timeline for when all services would be restored, but did say that "all hands are on deck."